While there are hundreds of species and cultivars of Iris, we will limit ourselves to the most well known and popular Bearded Iris. Bearded Iris are long-lived perennials that produce thick underground rhizomes. They will grow and flourish nearly everywhere, from USDA Plant Hardiness Zones 3 to 10, with some winter protection in the colder regions. Iris plants grow in fan shaped clumps made up of slender strap shaped leaves. Iris are classified by size ranging from dwarf through tall. The dwarf varieties can be as little as 2" high and make a wonderful additions to the rock garden or low border. They are also the first to bloom in early spring. Tall Bearded Iris can attain an imposing height of 3 feet and make a stately statement with their upright sword shaped foliage. They are generally the latest of the group to bloom, from May to July. The gracefully shaped individual flower consists of 6 petals or segments. The center three petals are known as "standards" and are upright. The outer three petals gracefully curve outward and down and are referred to as "falls". It is these three segments that contain the "beard" which consists of a fuzzy streak along the center of the petal. Bearded Iris come in virtually all colors of the rainbow except true red, green and black, including white, yellow, orange, pink, wine, blue, and purple. In addition, there are bi colors and fabulous combination blends to delight the eye. The plants prefer full sun or partial shade in the hotter regions of their growing area. Soil should be rich and fertile and plants need plenty of water during their growing and blooming cycle.After about three years growth, inspect your plants to see if they appear to be too crowded. If so, it is time to divide them. The best time is after the blooming season, from July through October. If you are preparing a new area for planting, you can work some fertilizer into the soil, water and let the bed settle for a few days. Trim the tops of the new divisions to about one third of their height to conserve moisture and keep the plants more stable. Plant 10 to 18 inches apart in a good organic and well drained soil, to a depth to where the rhizome is just covered. If your soil is mostly heavy clay, enrich with compost, or plant higher, with part of the rhizome exposed above the soil level. In either case, the roots should be spread out and downwards so that they hold the rhizome firmly. Tamp down soil around the plants and water well until established. 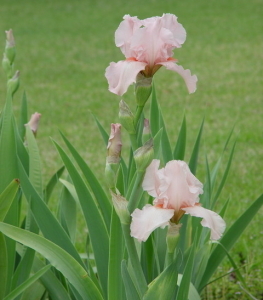 Try some Bearded Iris in your back yard garden this year. As exotic and fragile as they appear, they are among the easiest of the early flowering perennials to grow.